a stroke of fabulosity: "Anything you do, work or pleasure, you have to do it with zest." -Christian Dior, from "The Little Dictionary of Fashion"
"Anything you do, work or pleasure, you have to do it with zest." -Christian Dior, from "The Little Dictionary of Fashion"
ANNOUNCEMENT: I changed my blogspot URL. It is now http://bergdorfprincess.blogspot.com, like my tumblr (http://bergdorfprincess.tumblr.com). 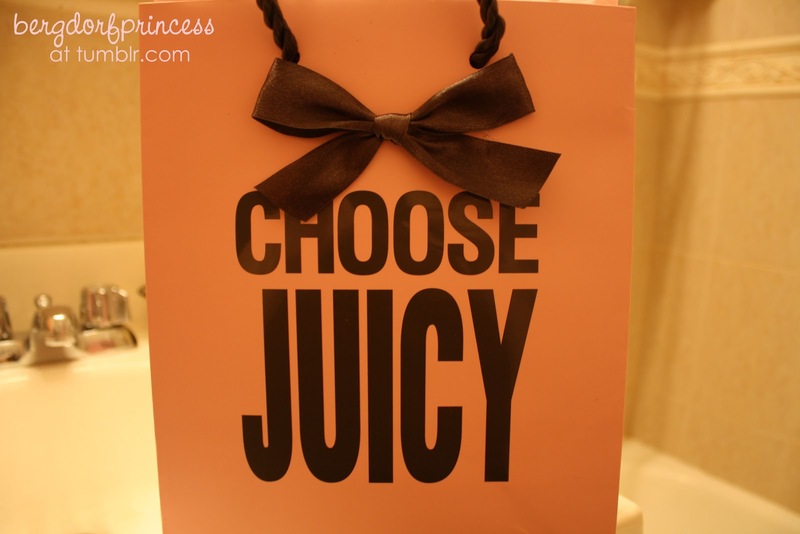 This post is going to be devoted to all of my latest Juicy Couture purchases. I know a lot of people find Juicy to be tacky/young, but I really adore their clothing items and some of their accessories. Their velour sweatsuits may not be fashion forward, but they are extremely comfortable for lounging around. That being said, I wouldn't be caught dead with a velour logo handbag. I do love everything I purchased from them, though! Let's start with the boring stuff first - socks. 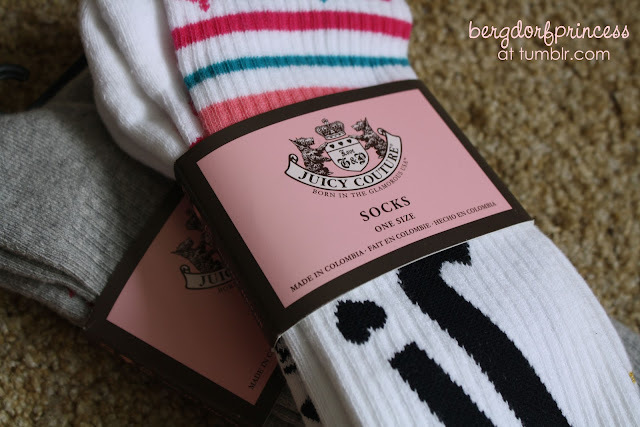 I do love Juicy socks. They are really great quality. 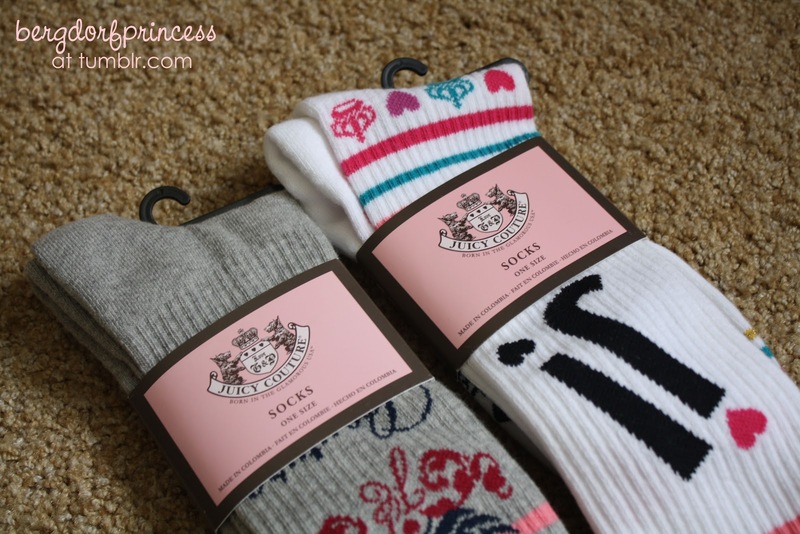 Most knee high socks roll down, but Juicy socks have a strong grip and are really great. They're super warm and they stay up, which is perfect, as NYC is growing colder by the second. My next purchase was also fueled by the cold weather - a new cardigan! It was hard to get a good photo of it - I need to come up with a more creative way of taking shots of clothing. This cardigan is delightful. It's a gorgeous burgundy color (it's darker in real life than in the photo) with cute gold and red buttons. On to my next purchase - new pajamas! I needed pajama pants and I figured I might as well get the top to match. I'm wearing these pjs right now, and they are so unbelievably soft and comfortable! Here they are with my Juicy Couture silk eye mask. I have to admit, I bought it on a whim (it also came with a matching silk pillow case). However, it is literally one of my favorite purchases - I put this baby on and doze right off. Another purchase: a Juicy Couture hair band. I saw this a while ago at Nordstrom Rack, and it went on clearance so I couldn't resist. And now for the purchase I am most excited about: my Juicy key fob! 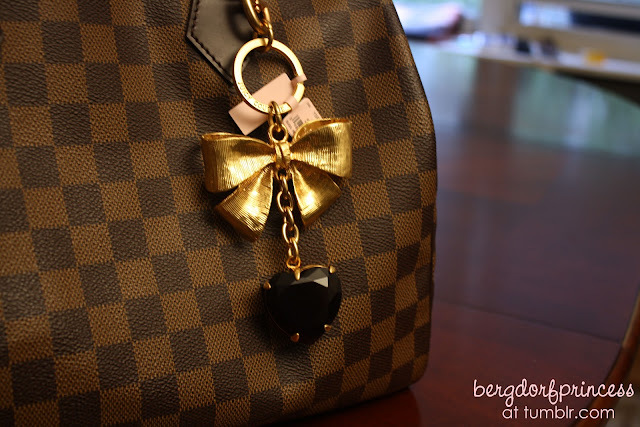 I am using it as a bag charm on my LV Speedy. 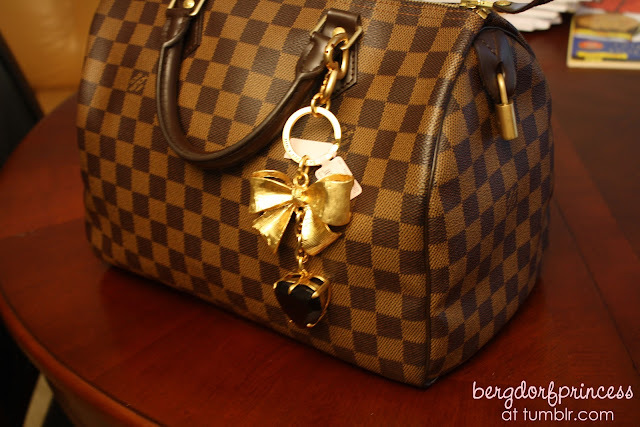 I've wanted a bag charm from LV for ages, but I can't bring myself to splurge on a $300+ brass keychain. This one was on sale for $40 (originally $58, though unfortunately it was almost as expensive with shipping). Tell me what you think! I hope everyone had a lovely weekend, and happy Rosh Hashanah to all those who celebrate! The bag charm is really pretty. I love your jammies and bag charm. Everyone thinks I'm crazy for wearing an eye mask but they are life changing lol. Ooh, the eye mask is precious! :) Love all the purchases you got! This makes me want to go Juicy-hunting now... hehe!